Enjoy this efficiency studio at reduced rates for August and September. 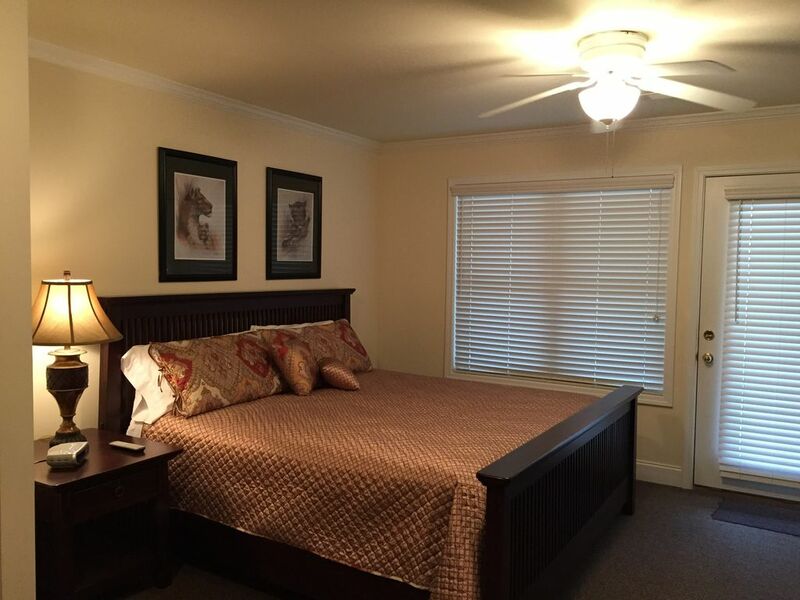 This is a well appointed studio condo with comfortable King bed, fireplace, screened porch, kitchenette, bath with shower and jacuzzi tub. The unit is within walking distance to all of Helen's amenities, including dining, shopping, groceries, and activities. Enjoy all Helen has to offer such as tubing on the Chattahoochee, hiking, horseback riding, golf, wineries, ziplines, kayaking/canoeing, swimming and miniature golf. No matter what your interests are, Helen has something for everyone, and this studio is convenient to it all. This unit is in downtown Helen where bars, restaurants, shopping, etc. are all within walking distance. Very cozy and quiet. Close to every thing anyone should need. Felt very comfortable and safe walking in the area. My husband and I were very pleased with the condo in Helen, GA. It was very clean and close to everything in town. Definitely will stay again when we visit Helen, GA.
We really enjoyed our stay and the property was well kept and in a great location. Will definitely consider in the future. This was a great room. Very homey, comfortable, and clean. Great location. As all the comments state, the walls are ridiculously thin. We could hear the people snoring in the room next to us, and they weren't even very loud. I just played rain sounds on my laptop the whole night and it wasn't a problem at all! I would recommend this place and I would stay here again for sure. The Helen area is rich in outdoor activities including hiking, kayaking/canoeing/tubing, bicycling, horseback riding, ziplines, and trout fishing. In addition, this area has an abundance of wine venues and tour options available.